In some cases, students postpone their work till the last day for many different reasons. What do you need to do if you have only one day before the deadline in your college? There are many reasons how it could happen - you were busy the last weeks, had some problems or just procrastinated. Do not worry about it! Your problem certainly has its solution - you can follow our advice from this article, or you can write a research paper in one day with the help of our service! If you want to learn how to start research paper for the university if you have just one day left. First, study all the requirements you have carefully and don’t miss anything important before you select your topic. After that, pick your topic. Try to pick a broad topic because you can find more relevant information instead of looking for obscure articles. You can also find papers by other authors that are already done - it’s much easier to collage other research and write your paper in your own words. You should research before creating an outline because you must understand that there is enough supportive information on your topic. You can use various sources but don’t forget that every article you read should have an author. You must indicate the sources you have used. Sites like Wikipedia, despite all the advice not to use it, can help in creating an outline for your text. But do not copy and paste from Wikipedia - professors usually check it first if they want to check for plagiarism. Also, instructors still prefer books or printed articles to online sources. Thus, try to use them. If you haven’t any printed books on your topic, use Google to find available scans or electronic copies of them. While preparing your work, do not read the whole book! You don’t have time for it. Find the sections that are related to your topic, copy and paste them into the draft document and use them while working on your research - re-write the material in your own words. Finally, don’t forget to cite the sources you have used. After you have completed your research, you can prepare your thesis statement it should not be too broad - a thesis shows the main problems related to your research. Thus, it should be short and clear. While writing a thesis, you should not limit the things you are talking about but at the same time, you should make your thesis statement specific. Your thesis should not be groundbreaking, innovative, or genial - just follow the central direction you have chosen and give the necessary information. Also, don’t forget to write your thesis as the last sentence in your introduction part. Think about the number of paragraphs in your paper and distribute the information you have throughout these paragraphs - it will be the body of your text. Write the selected sources in your own words to make the paragraphs for the body of your text. After that, carefully check the style in which you have written the main parts of the text while working with the sources. The whole text must be written in one style in order to avoid plagiarism that your professors could notice while reading your work. Finally, add all citations at the end of your text. Now prepare the introduction of your text. It should contain about five sentences and you need to introduce the topic in this part with some general words and finish your introduction with a thesis statement. To write a good conclusion, figure out the most important facts that you have written and restated them briefly in other words. The conclusion should contain the facts that must be remembered by your reader and emphasize the general idea of your text. At the end, prepare a list of citations. After you have done all your work, start checking your mistakes. If you do it in the morning the next day your mind will be much clearer after you sleep and relax. This way, you can have a look at your paper from another perspective and find mistakes more productively. While proofreading, get rid of all extra sentences that don’t relate to the main topic and check for grammar and spelling mistakes and also check the format of your citations. 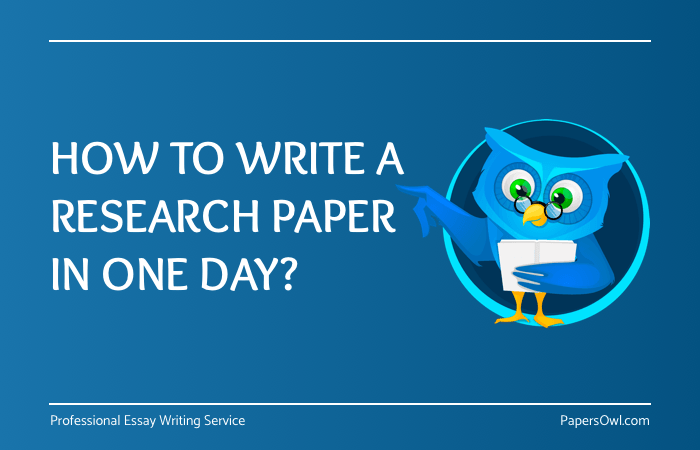 This simple advice can help you, even if you have just one day for your academic paper. However, if you are still unsure how to write a research paper in one day, you can always order a research paper from research paper writing service - our qualified writers can write a research paper fast and professional - you certainly will be satisfied with it. They can do your work in one day! A research paper is an important part of education and it has to be done well. Even if you don’t have enough time, do not worry about it and follow the requirements or order a text from our service. You will see, it’s quite easy to do such work in one day. We hope that our tips will be useful to you and your future work.